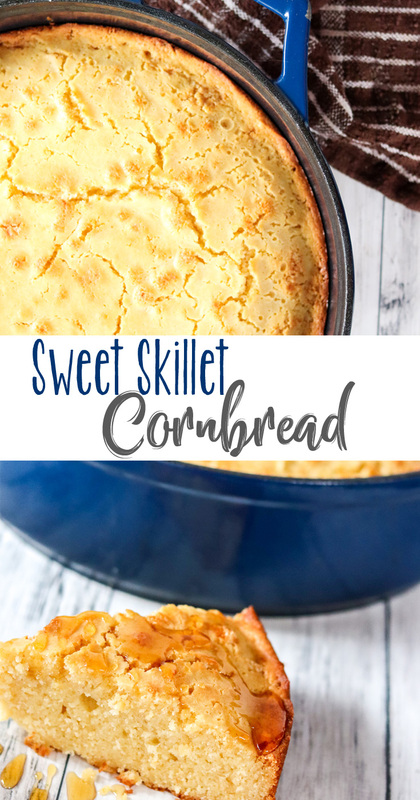 Sweet Skillet Cornbread enhances the delicious naturally sweet flavor of corn by adding honey and making a much softer, more moist and sweet cornbread. It’ll make a cornbread lover out of you after-all. It’s the second day of side dish week, and I brought my Sweet Skillet Cornbread to the table. I was going to avoid doing sweet side dishes this week, after all the sweets and treats I’ve been making lately, but I couldn’t resist sharing this version of our Moist Sweet Cornbread with you instead. It’s pretty easy. Everything goes in one bowl, mix it all up and pour straight into your favorite cast iron skillet. 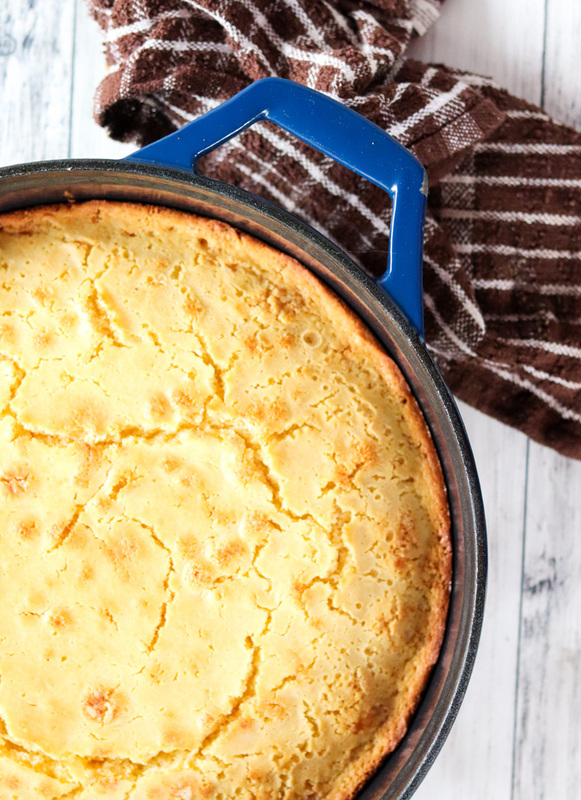 Bake for a bit and you’re going to be devouring this Sweet Skillet Cornbread in no time at all. 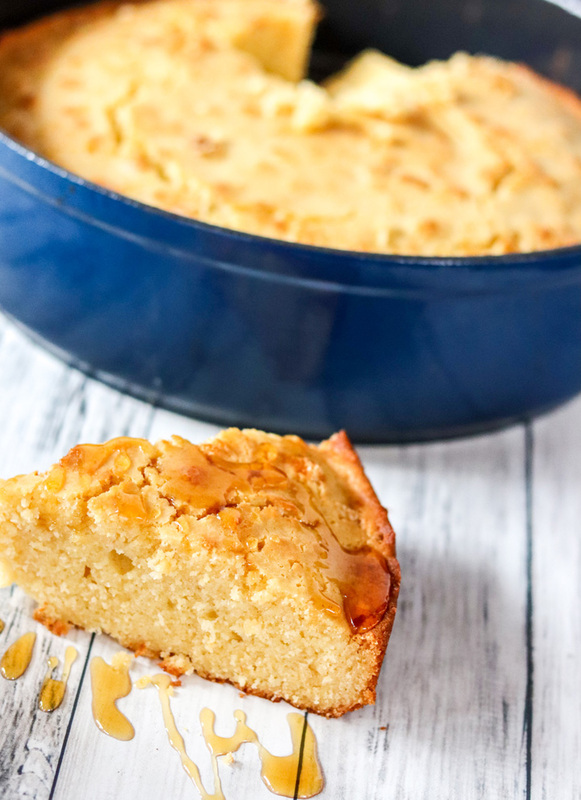 This Sweet Skillet Cornbread is amazing served warm or cold, but you’ll be missing out on something special if you don’t drizzle with some honey. This is by far one of my daughter’s favorite recipes that we make as a family. Not because of how easy it is. It totally is. But because she has never liked traditional cornbread recipes. At all. This Sweet Skillet Cornbread? She could devour an entire skillet, I assure you. This is our favorite side dish “bread”. We tend to make this to go with darn near anything – from seafood to pasta, and steak to chili, it’s literally perfect. 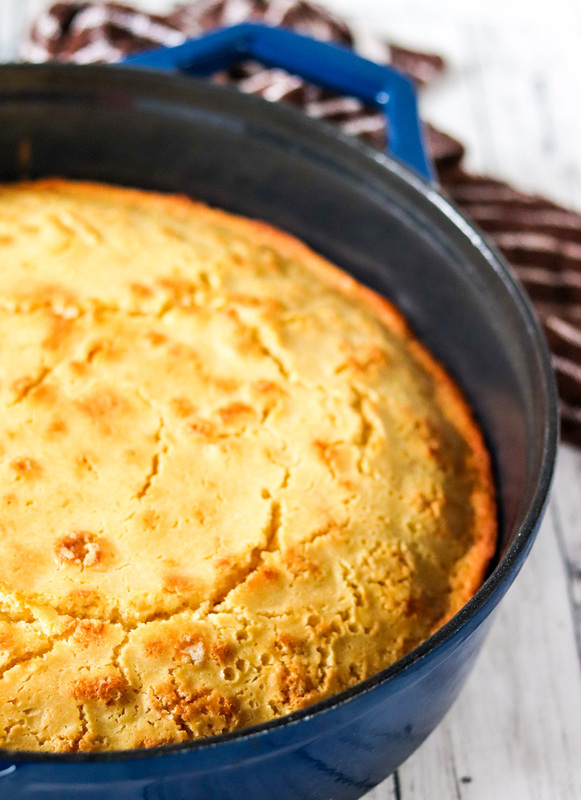 Yes, you can add canned corn, fresh corn or thawed frozen corn to this Sweet Skillet Cornbread recipe. Drain a can of corn and toss it in at the end, gently folding in. Yes,, you can add jalapenos the same as the corn, drain and gently fold in at the end. Be aware though, this is NOT a savory cornbread so jalapenos can be a little jolting to someone not expecting it. They are delicious though. 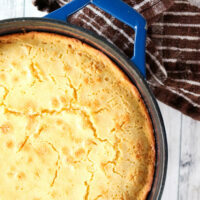 Are you ready to make Sweet Skillet Cornbread? Sweet Skillet Cornbread enhances the delicious naturally sweet flavor of corn by adding honey and making a much softer, more moist and sweet cornbread. It'll make a cornbread lover out of you after-all. Preheat oven to 350 degrees and prepare your cast iron skillet. I spray mine with a light coating of cooking spray. Pour in the canola oil, melted butter, honey, beaten eggs, and half and half, and stir just until moistened. Pour the batter into the greased baking dish and bake in your 350 degree oven for 40-45 minutes. Keep a careful watch starting at about the 35 minute mark. How quickly the cornbread cooks or how long it takes is more dependent on the size of skillet you use. What you want is, towards the end, you want it to be turning golden and starting to show some cracks. Insert a toothpick and be sure that it comes out clean. Great recipe. I like my cornbread on the sweet side. This looks scrumptious and SO easy! I love the idea of adding some jalapeños for a little kick!